ESA’s Mars Express imaged the striking upper part of the Reull Vallis region of Mars with its high-resolution stereo camera last year. Reull Vallis, the river-like structure in these images, is believed to have formed when running water flowed in the distant martian past, cutting a steep-sided channel through the Promethei Terra Highlands before running on towards the floor of the vast Hellas basin. This sinuous structure, which stretches for almost 1500 km across the martian landscape, is flanked by numerous tributaries, one of which can be clearly seen cutting in to the main valley towards the upper (north) side. 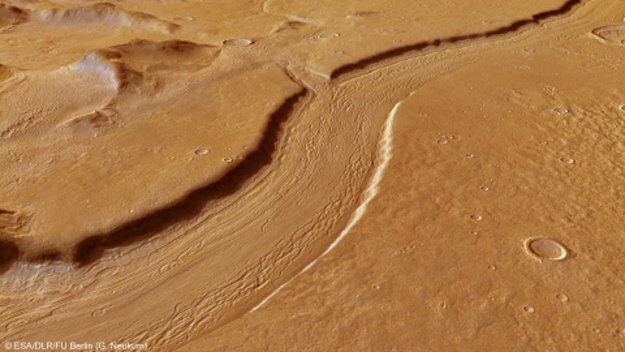 Read more: Reull Vallis: a river ran through it / Space Science / Our Activities / ESA.